Have you ever had that incredible experience of learning that your prejudgement or assumption about something is incorrect? Well meat loaf is one such realization for me (I'm talking about the food not the singer). I never really ate it growing up and I'd never been inspired to try a recipe for it because I always thought it sounded unappealing in a way. Well, a few years ago after making meatballs I had the idea of using some of these ingredients in a new way. I took some liberties substituting the ground beef for lighter and leaner ground turkey breast. But I incorporated some of the same themes from the meatballs such as bread crumbs, chopped onion, and parmesan cheese along with some spices, herbs, and an egg for binding everything together. The resulting meat loaf was moist and delicious – not to mention easy and incredibly versatile. I've since made many variations of this meat loaf and I'll share my most recent one with you here. Some of the staple ingredients that I use in all of my versions include: ground turkey breast, bread crumbs, chopped onion (this is what keeps the meat loaf incredibly moist and delicious), one egg, salt, a pinch or two of red pepper flakes for a little kick. I also usually add some cumin too as this flavor works so well with the turkey. The rest of the seasonings are inspired by what I have around – if I have fresh herbs I'll use them. Parmesan cheese is yummy too as are any spices that speak to you from your cabinet. The meat loaf that I made yesterday is a tribute to what I had in my refrigerator – the ingredients can easily be substituted to match your tastes. For the sake of making this meat loaf sound a little more jazzed up I'll call it: Ground Turkey with Cilantro and Spices. Note: Most meat loaf recipes call for ketchup on top of the meat while it bakes in the oven. Here I omit that because I like the crisp golden crust that forms on top while the inside remains moist as a result of the flavorful chopped onions. I serve the ketchup tableside. 2) Place all ingredients in a bowl. With clean hands mix together until all ingredients are evenly combined but do not over-work the meat with your hands as you don't want it to be tough. 3) Place meat mixture on an aluminum foil lined baking sheet (you can also add a little oil or non-stick spray to the middle of the lined baking sheet where you will place the mixture to ensure that it won't stick). Using your hands form the mound into a neat rectangle that is approximately 2 inches high. You can actually make this into any shape that you like just make sure it's uniform height so that it cooks evenly. The thinner it is the faster it will cook. 4) Place in oven and cook for 25-30 minutes. Serve with ketchup. Looks and sounds great. 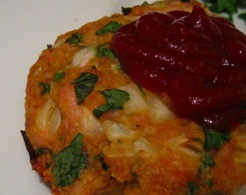 A new version I have been trying is Buffalo Meatloaf. It is a healthier version than ground beef and if cooked slow and a bit more moisture (olive oil or veggie oil or other alternatives) can be very, very good. My recipe, which I can send along if you like, calls for cherry tomatoes on top and my wife and I have liked that in place of ketchup. I also experimented with panko instead of traditional breadcrumbs. MK – Thanks for your comments! I’ve never tried Buffalo meat and would love to have a copy of your recipe. The cherry tomatoes on top sound really good. I’ve definitely noticed a divide among cilantro lovers/haters and even read somewhere that it may be due to genetics why some people like the taste and others find it to taste “soapy”. Cilantro is easily substituted here with parsely. I visited the site that you sent – who knew people were that vehement about their distaste for cilantro? 1/2 cup chopped fresh flat-leaf parsley or Cilantro! Cook onion, celery, carrot, and garlic in 2 teaspoons oil in a large nonstick skillet over moderate heat until onion is softened. Transfer to a large bowl and stir in bread crumbs, parsley, egg, ketchup, Worcestershire sauce, salt, and pepper. Stir in buffalo (do not overmix) and form mixture into a 10- by 4-inch oval loaf in a large shallow metal baking pan. Toss shallots and tomatoes with remaining teaspoon oil and salt and pepper to taste, then scatter around meat loaf. Bake in middle of oven 1 hour and 10 minutes, or until a thermometer inserted 2 inches into center registers 160°F. Transfer meat loaf and vegetables to a platter and let stand 10 minutes. While meat loaf is standing, deglaze baking pan with water over moderate heat, scraping up brown bits, and pour through a fine sieve into a bowl. I’ve always been kind of disgusted by meat loaf and I’ve never wanted to try it. Of course, I never have tried it so I have nothing to base this on. But I’m trying to be more open-minded, so maybe I should give it a try.